Exterior Painting for residential homes and commercial buildings is usually something that is done by a professional painting contractor, and this will take some careful preparation work and the perfect color of paint. Choosing that perfect color that will make your exterior come to life can be a little tricky. The following are a few ideas to help your with your choice. Many individuals cannot visualize their home with a different color of paint especially if it is a big change. Changing the color for the exterior will also probably mean changing the contrasting or complementary color for things like the trim, shutters and doors. Take a look at the number of items that will be need painting and then decide how many color choices you will need. If you cannot decide how many colors you need to achieve your desired look you can check out some of the neighbors' homes. 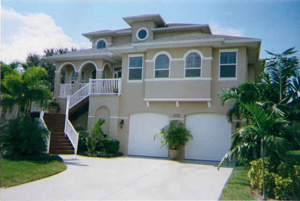 Usually Tampa Bay homeowners will paint their exterior trim with a contrasting or complimentary color to the house siding and then use a third color for the doors and shutters. The exterior trim is usually done in a shade of white but this will depend on the main color choice. Another consideration in making your color choices is the materials used in the construction of your home and the style of the dwelling. The color of the roof, any existing stone work or bricks all need to be at least tone matched to the new colors. The color you choose should blend with the materials of the home. For an exterior that is all brick, the trim paint should blend with the mortar. In this instance white is not the best choice. The roof color is a big consideration. A house painted yellow would look rather odd with a black roof but would compliment a brown roof. Generally we use Porter Paints, Sherwin Williams, Benjamin Moore. If you're looking for a Professional Exterior Commercial and Residential Painting Contractor, contact Arrow Painting Restoration today at (813) 840-3717, (727) 804-5411 or (941) 870-8078, or complete our estimate request form.